Cauliflower can be so much more than a steamed vegetable side dish. In fact, our sister publication Cooking Light figured out a way to transform it into a healthy pizza crust! (Watch the video below to see how to make it at home.) 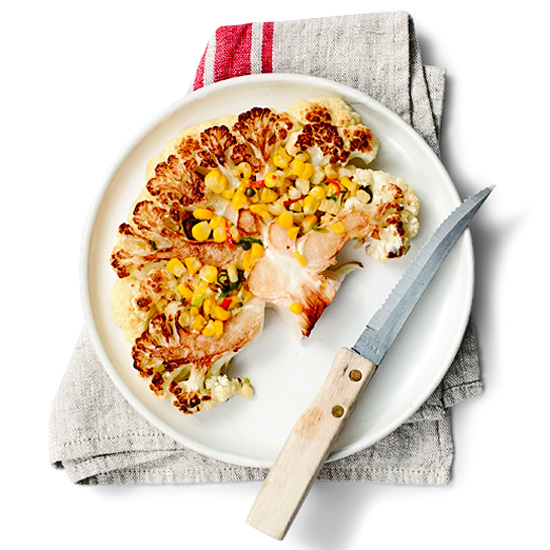 Here, other out-of-the-box recipes for cauliflower. This ultra-crispy cauliflower, a.k.a. KFC, is battered, fried and tossed with a sweet and fiery sauce made with gochujang, the pepper paste that is a staple of Korean cooking. Bloggers Jasmine and Melissa Hemsley mix quinoa with grated cauliflower, salty halloumi cheese and chickpea flour to make crisp, fluffy little balls to serve as an hors d’oeuvre or with tomato sauce as a main course. Here, bacon, sautéed cauliflower and grated Parmesan complement each other in an original and satisfying frittata. In a clever twist on clafoutis (a dessert of fruit baked in a sweet custardy batter), this savory version is packed with colorful vegetables like orange cauliflower and purple sweet potatoes. For this vegetarian main course, a whole head of cauliflower is simmered in turmeric water, then stuffed with nuts and spices and slathered with a spicy paste. To create these wonderful tapas, José Andrés makes a batter with crunchy nubs of chopped cauliflower florets, fries spoonfuls in a skillet, and then tops the fritters with yogurt sauce and a dollop of caviar.